Happy New Year! And what a year it has been. Eleven months of slow travel through eight countries of Latin America - A journey which began and ended in Cuba, the country I could return to again and again. I am thankful for all of the wonderful, as well as not so wonderful moments, and the unforgettable friendships gained. Ringing in the New Year in Vinales, my favourite town in Cuba. Nearly all of January and February was spent in Havana, and despite the devastation caused by Hurricane Sandy, I finally made it to Santiago. While a large city by Cuban standards, Santiago has a completely different energy than the fast-paced capital. 97-year old Santiaguera and former teacher to Raoul Castro, Justina had her house destroyed by the hurricane. As of March 2013, she still did not have a roof over her living room, bathroom or kitchen. An update received in November 2013 is that she now has a roof over part of her house, but not in its entirety. In the middle of March, I made my way to Mexico. It was my first time in Mexico City, a busy, bustling capital of 21 million, and at over 2200 metres - I struggled to acclimatize in more ways than one. 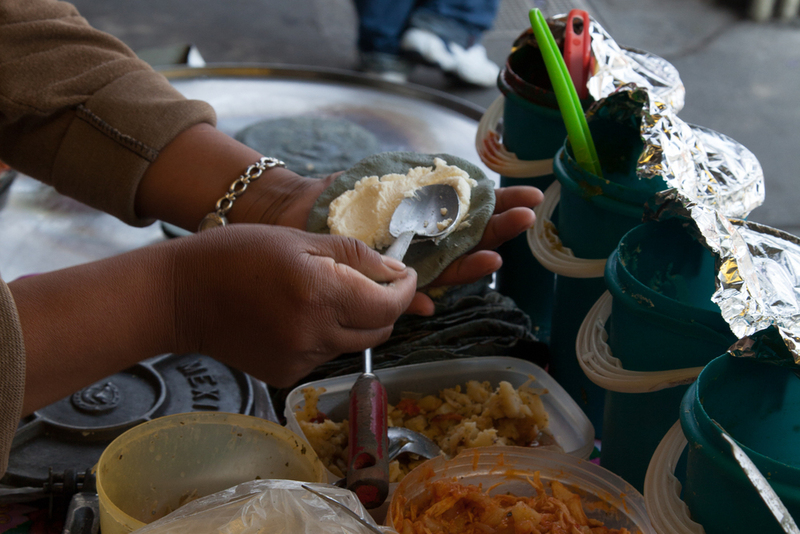 When recalling my fondest memories of Mexico, my thoughts always return to the food - whether in a high-end restaurant, or at a stand on the street, it's always delicious. The month of April was spent studying Spanish in Oaxaca. Filled with interesting art galleries, excellent restaurants and markets, stunning gardens, and affordable Spanish classes, what more could you ask for? A shopping excursion during a cooking class with Candeleria, owner of La Sureña Comedor at the Benito Juarez Market, Oaxaca. The filming of a commercial for Guelaguetza 2013. A few friends and I were invited to be extras and we were asked to 'play' the tourists - the hardest part about it was standing in the hot sun for several hours. The large festival takes places every July. In the middle of May before heading on to Chiapas and then to Guatemala, I attended the first Vela of 2013 in Juchitan, located in the Ithmus of Mexico. A very elaborate affair, these women (coming from matriarchial communities) know how to throw a good party. See Juchitan Knows How to Party for more. A young girl admires the stage where the new vela (similar to the queen of the ball) will be throned. A very festive event, food and drink is copiously served and enjoyed in between dances. Each of the tops worn by the ladies are hand woven and cost hundreds of dollars. Beginning my position at the end of July, I had nearly two months to travel before work began. First stop - El Salvador. An amazing coffee tour in Juayua - a small town in northern El Salvador, along the Ruta de Las Flores, an area famous for its high altitude coffee. See Picking Up the Pace: La Ruta del Las Flores for more. July was a busy month - I passed through the borders of Nicaragua, El Salvador, and Belize, finally making it back to Guatemala by the end of the month. It was the most ground I'd covered in months - I traveled by foot, by bici-taxi, by ferry, by speed-boat, by chicken-bus, by coach bus, and by airplane. I was exhausted. Isla de Ometepe - made up of two volcanoes in the centre of Lake Nicaragua, this is an island paradise. The hike up either Madera or Concepcíon however, is no easy feat, respectively an eight or twelve hour hike up. Seventy kilometres east of the mainland, Little Corn Island is a long 30 hour journey from Managua (or a thirty minute flight). With an area of 2.9 square kilometres, it is an English speaking island, well known for diving and a bit of R&R. Caye Caulker - On the long journey back to to Guatemala, I passed through Belize to renew my 90-day visa (CA-4 VISA for Guatemala, Honduras, El Salvador, and Nicaragua) and of course to go diving. While the most expensive country I'd been to that year, the diving in Belize was stunning. The next fourteen weeks were spent in Guatemala working at the Association Pop Wuj, a Spanish School and non-profit teachers co-operative that administers numerous health, social and environmental projects in communities in and around Xela. Malnutrition remains a large problem in Guatemala, particularly in the Western Highlands. Pop Wuj with the funding of Timmy Global Health administers a monthly Nutrition Program in three Mayan communities. See the Pop Wuj blog for more info, and if you would like to make a donation. Pop Wuj also runs an educational support centre in the community of Llanos del Pinal, located at the base of the Santa Maria Volcano. Students range from between the ages of three and nineteen years of age. Top: Ame and myself; bottom: left to right, Marie-Sol and Ilcy. At the end of October, I returned to Oaxaca to celebrate Day of the Dead (Dia de Meurtos), a week-long celebration of death and remembrance of loved ones. In and around Oaxaca, alters are created in homes and by businesses to honour those who have passed on. These photos were taken in Xoxocotlán just outside of Oaxaca. Oaxaca is known as one of the best places in Mexico to celebrate Day of the Dead. With countless parades and shows, the cemeteries were full of visitors and families - it was a great excuse to get dressed up. Here we are, the three Catrinas: left to right, myself, Tara and Jessica. The last three weeks of November were spent back in Cuba, in Santiago and Havana. Whether it is the music, the people, the dancing or a combination of the three, despite its political and economic challenges, there is an undeniable, unique and contagious energy that radiates from Cuba. December had me back in Ontario for what feels like the coldest winter on record in years. Despite inches of snow both in Ottawa and Toronto, minus 40 degree temperatures with windchill in Ottawa, and an ice storm that left us without electricity for 52 hours in Toronto - it's good to be home and close to friends and family. A special thanks to: everyone at the Yoga House who supported me, fed me, and further developed my yoga practice over the three months I lived in Xela; the volunteers, teachers and coordinators at Pop Wuj who work tirelessly on projects to support long-term development in communities in the western highlands of Guatemala; Grégoire Désert, my travel companion who put up with me for two months as we swept through El Salvador and Nicaragua; and Steph Dunn, my roommate from two different countries - I could not have met a dearer friend. Finally, a big thank you to everyone at home who has followed my journey, supported me, managed my affairs (Thank you Cory Peddigrew!) and as my mom says, 'prayed for my safe return'. Happy 2014 - Wishing you and your loved ones, a year of health, love and happiness! Just after the border crossing in Nicaragua, we get on while our driver and assistant are having a little siesta. Except for a dodgy ferry that takes you across the bahia (which is also disputed territory) between El Salvador and Honduras, the only way to get from El Salvador to Nicaragua is by making a 150 KM overland trip across the south western part of Honduras. While initially hoping to make it across the border in one long travel day, by mid-afternoon we decided it was best to spend the night. The Honduras-Nicaraguan border is technically open for 24 hours, but travel after 6 PM isn’t recommended, and the local buses also stop running after dark. We spent the night in Choluteca, Honduras - known to be the hottest place in the country, and hot it was. Five buses, 27 hours, and $11 US dollars later (excluding accommodations), we were in the northern part of Nicaragua! Our first stop was Cañon de Colaradito. Measuring up to 300 metres deep in certain areas, and located in a lush forest, it was declared a national treasure in 2006. There are three mirador’s from the top, and you can also take hikes around the base itself. Somoto is the nearest town, but the park itself is located closer to the Honduran border . We spent the night with the family of a local guide, Bayardo Soriano. He lives at KM 230 (between the border and Somoto) on a small lot of land, with three generations of Soriano’s, 4 dogs, 5 cows, 2 cats, and a dozen or so chickens (ask the local bus for KM 230 or take a taxi). The family offers modest dorm style accommodations for 50 cordoba (approx. $2 US), meals are extra, and tours of the cañon range from $10 to $20 US depending on the length of the tour. The tour includes (or can include) light hiking, floating down the river (and hiking along-side it when the water level is too low) sliding down waterfalls, and a an optional waterfall jump. A few other families also offer the tour which can also be booked through a travel agency in Somoto - but Bayardo’s prices were extremely reasonable (a hotel would cost about $25 a night). Staying with the family was amazing. Just a note - Bayardo does not speak English but most of it the tour is self-explanatory, so basic Spanish is sufficient. Note: On shorter notice, better to call in advance rather than email - he doesn't own a computer or have regular internet access.